"It’s kind of a shame, but you can’t see the best part of this boat because it’s under the waterline"
Below deck there is an owner’s cabin fore with a central bed and an en suite with a large shower. A sultry cloud hangs over the Cannes Yachting Festival, trapping the brutal heat of the Mediterranean sun. The tired throng shuffles feet and mops brows; tanned Italians are steaming in tailored suits and pretty French girls frying in summer dresses. It has been a long day dockside and all I can think of is escape: from the heat, from the crowds, even from the most beautiful boats of the year. 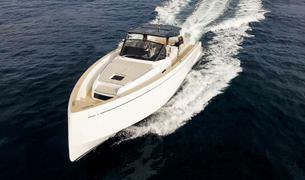 Luckily, I have a sunset sea trial scheduled on the new Pardo 50 and the thought of a top-speed ride through the Bay of Cannes is the dangling carrot that gets me through. Bring on the wind, bring on the spray, bring on the speed. 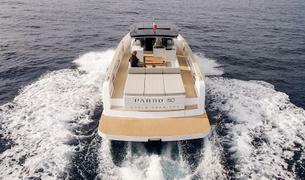 The hull we’re testing is Pardo 50 No 1 and its engines, twin Volvo IPS 800s, make a throaty gurgle as we join the cluster of boats waiting to exit the port. I notice we’re getting a lot of attention from photographers and it’s well deserved: the boat has compact, sporty good looks, with nothing extraneous and an inverted bow that speaks of speed. Her hull stripe has a familiar flare with “Pardo” rather than “Grand Soleil” written at the end: both of these brands are built in Forlì, Italy by Cantiere del Pardo. We’re finally good to go and the driver hits it. I get a brief moment of sheer, speed-induced exhilaration when just as suddenly we come to a stop. Did something go wrong? No, we’re getting ready for a zero to top speed demo. I brace myself, but the progression from a full stop to 36 knots takes just eight seconds and is so smooth that I barely notice it. Except that I can’t keep my hair from blowing all over the place. The engines are screaming, but we are not. The boat is set up for some smooth flow above the waterline too. The tender lift beach platform is submersible to 80 centimetres. 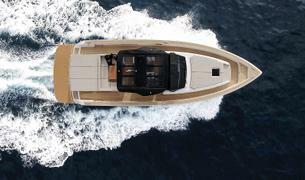 “That makes launching the tender or any toys in the garage easy and the platform itself also makes the boat very stable,” says Servidati. From there it’s just two steps up to the single level deck. The walkaround configuration feels very safe thanks to high gunwales, a long, continuous handrail and pinprick LED lights that illuminate the passageway at night. The boat is well set up for days in the sun, with sunpads and a settee fore, more sunpads aft overlooking the beach platform and a dining table in the guest cockpit that can fold out and adjust in height to convert the U-shaped banquette seating into another lounging space. But running to a secluded bay to enjoy the sun is only the start of the party. 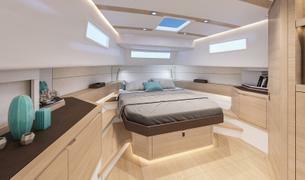 There are cool boxes under the cockpit seating and an outdoor galley with an induction cooker, fridge and sink under the 16 square metre carbon-fibre T-top. “The T-top is built in one piece by a company that also works for Lamborghini,” says Servidati with a measure of pride. Evolving from the Pardo 43 that launched last year, there is improved access with a passage through the middle of the space under the T-top to the helms and companionway. We head back to the dock too soon. I feel totally refreshed but look back at the Pardo 50 feeling like I’m missing a part of the equation. Then I realise why: I have been speeding through a bay but I’m perfectly dry. We sliced through wake and waves without bouncing and there was no splash or spray. It’s lucky that I was taking notes and not just recording my conversation with Servidati because, while my handwriting is steady and legible, the wind we were kicking up made my recording inaudible. That was one very cool breeze.